The largest particle accelerator in the world – the Large Hadron Collider at CERN in Switzerland – has a circumference of around 26 kilometres. Researchers at Friedrich-Alexander Universität Erlangen-Nürnberg (FAU), Germany, are attempting to go to the other extreme by building the world’s smallest machine of this kind – a particle accelerator that fits on a microchip. The research team has now taken another step towards achieving this ambition. The fundamental idea behind the miniature particle accelerator’s development is to enable scientists to use laser beams to accelerate electrons. What sounds deceptively simple in theory raises a whole series of challenges in practice, extending across various fields of physics. For example, the scientists need to be able to control the oscillation of light and the movement of electrons with great precision in order to ensure that they meet each other at just the right moment. One way of envisaging this is to imagine a ship on a stormy sea; to safely ascend the wave and come down on its other side, the helmsman has to watch the oncoming wave and judge when it will meet the vessel. It is equally crucial for the FAU’s team of scientists to ascertain when and where the maximum crest of a light wave will hit a packet of electrons so that they can influence the outcome to a highly specific degree. This means they need to enable light and electrons to coincide within ‘attoseconds’ – that is, a billionth of a billionth of a second. 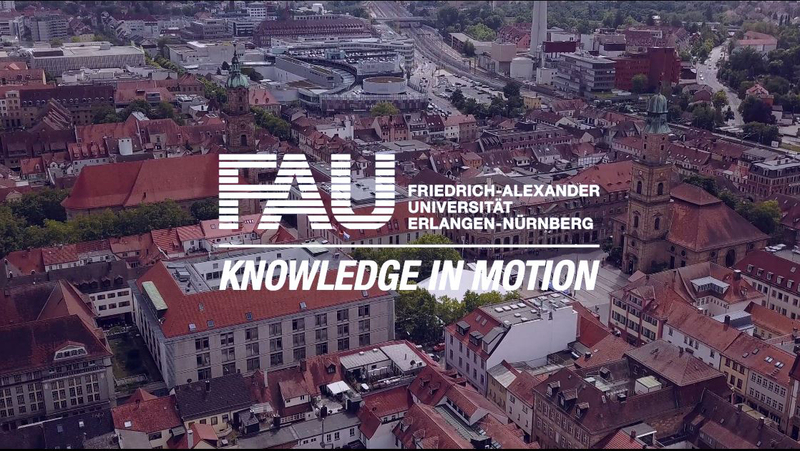 In an exciting first, this is exactly what the research group around FAU’s Prof. Dr. Peter Hommelhoff have succeeded in achieving. The team has developed a new technique involving the intersection of two laser beams oscillating at different frequencies in order to generate an optical field whose properties the researchers can influence to an extremely precise degree. The key property of this optical field is that it retains contact with the electrons, effectively moving with them – hence its being termed a travelling wave – so the electrons can continuously sense, or ‘surf’, the optical field. In this way, the optical field transmits its properties exactly to the particles. Not only does this process cause the particles to precisely reflect the field structure, it also accelerates them – to a strikingly high degree. This effect is crucial to the miniature particle accelerator’s practical application, as it relates to how much energy can be transferred to the electrons across what distance. The acceleration gradient, which indicates the maximum measured electron energy gain versus distance covered, reaches the extremely high value of 2.2 giga-electron-volts per metre, much higher than that attained by conventional accelerators. However, the acceleration distance of only 0.01 millimetres currently available to the research team in Erlangen is not sufficient for them to generate the energy needed for achieving results of relevance to practical applications. ‘Despite this, for particle accelerators in medicine, we would only need a tiny acceleration length of less than a millimetre,’ explains Dr Martin Kozák, who carried out the laboratory experiment. In 2015, the FAU researchers teamed up with scientists from Stanford University and eight other international partner institutions in the Accelerator on a Chip International Program (ACHIP). The Gordon and Betty Moore Foundation has generously provided five years’ funding to the project; of the total grant of 13.5 million dollars (approximately 12.5 million euro), 2.44 million dollars (approximately 2.26 million euro) went to FAU.